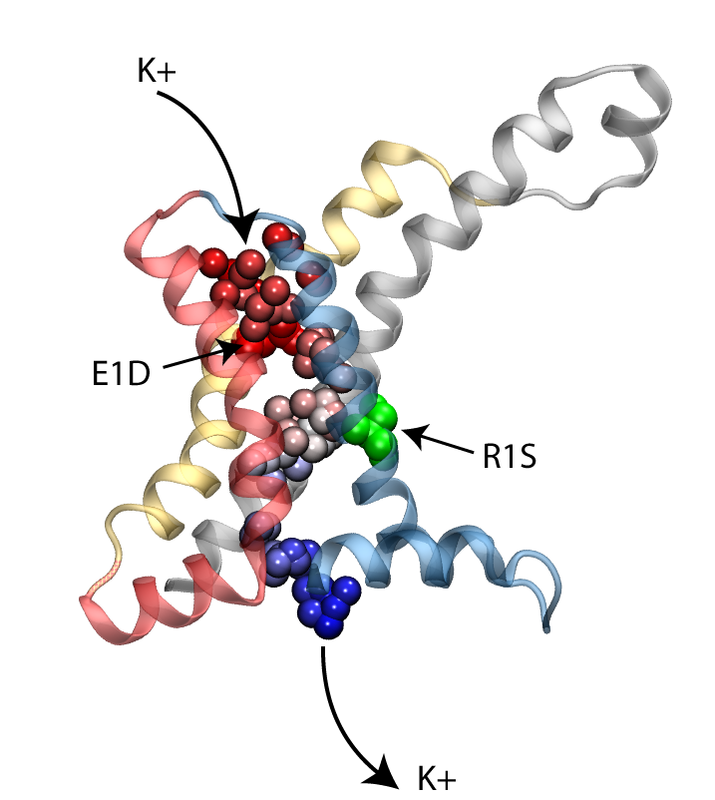 K+ channels are membrane proteins that allow rapid and selective flow of K+ ions across the cell membrane, and thus generate electrical signals in cells. 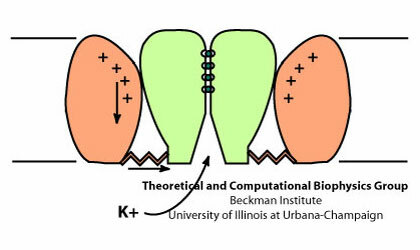 Voltage-gated K+ channels (Kv channels), present in all animal cells, open and close upon changes in the transmembrane potential. Kv channels are one of the key components in generation and propagation of electrical impulses in nervous system. Upon changes in transmembrane potential, these channels open and allow passive flow of K+ ions from the cell to restore the membrane potential. Schematic view of the gating process in Kv channels. The tetrameric structure of Kv channels is made of two functionally and structurally independent domains: an ion conduction pore, and voltage-sensor domains. The ion conduction pore is made of four subunits which are arranged symmetrically around the conduction pathway. Voltage-sensor domains are positioned at the periphery of the channel and consist of four transmembrane segments (S1-S4). Structural rearrangement of the voltage-sensor domains in response to changes in the membrane potential, and in particular S4, which includes positively charged amino acids at every third position, results in conformational changes in the conduction pore, which could open or occlude the ion conduction pathway. The nature of these movements and conformational changes in the voltage-sensors have been subject to controversy and several models for voltage-gating have been proposed. The recently solved crystal structure of Kv1.2, from rat brain, revealed the molecular architecture of the voltage sensor domain in an open state of the channel. Four Arginine gating residues are identified in the voltage-sensor domain shielded from the lipid molecules. Coupling of the voltage-sensors to the (gate in the) pore domain is via an amphipathic alpha helix that runs parallel to the membrane plane inside the cell. Conformational changes in the voltage-sensor domain are transferred to the ion conduciton pore via the helical linker, and result in opening or closing of the intracellular gate of the ion conduction pathway. However, the nature of this coupling, and the interactions between the linker and the pore still remains a mystery. The structural element responsible for the high selectivity of the channel, is a sequence of five amino acids that is highly conserved among potassium channels, voltage-gated or not. This stretch of amino acids, TVGYG, forms the narrowest part of the channel, also known as the selectivity filter. The ion conduction pathway is lined with oxygen atoms in this region which provide four binding sites for K+ ions. The ion conduction mechanism through the selectivity filter, has been postulated and studied . Our recent molecular dynamics study of the pore domain of Kv1.2, could provide trajectories of K+ ion conduction through the channel driven by a voltage bias across the lipid bilayer (click here to download a movie of the conduction trajectory (mpeg, 1.6M)). Our results are consistent with the knock-on mechanism suggested by Hodgkin and Keynes, in 1955. During the simulation the selectivity filter is occupied by 2 or 3 K+ ions at each time. The ions reside mainly at sites identified previously by crystallography and modeling, separated by water molecules. When a K+ ion approaches the filter from the cytoplasmic side, the configuration of the ions inside the selectivity filter changes, until the K+ ion enters the selectivity filter. Upon entrance of the K+ ion to the selectivity filter from the cytoplasmic side, the outermost K+ exits the channel to the extracellular solution. The jumps of ions between these sites and the sequence of multi-ion configurations involved in permeation are described thoroughly in here. Different scenarios for the K+ conduction through the selectivity filter were observed in our simulations, for which movies of the simulation trajectories are provided here (mpeg, 4.7M) and here (mpeg, 1.4M). Kv1.2 embedded into a solvated lipid bilayer. Upon opening of the channel, conformational changes in the voltage-sensor domains (VSD) result in the transfer of 12-13 elementary charges across the membrane electric field. This charge transfer is measured as a transient capacitive current that preceeds opening of the channel. Several charged residues of the VSD, in particular four arginine residues located regularly at every third position on the S4 segment, are known to move across the transmembrane field and contribute to the gating charge. The position of these arginines, known as gating arginines, are highly conserved in all voltage-gated potassium, sodium, or calcium channels. However, the extent of their movement and their displacement across the transmembrane potential has been subject to extensive debate. In collaboration with the Roux lab, we have been able to calculate the gating charge of a voltage-gated potassium channel, Kv1.2, from all-atom MD simulations. The total gating charge of the channel is calculated for the full tetrameric channel, as well as an individual voltage-sensor domain (VSD) in an explicit membrane-solvent environment. The free energy of each protein conformation (in the open or closed state) is a function of the external voltages applied. The displacement charge (or the electric dipole) of the entire system, including water, ions, and the lipid molecules, couples the potential energy of the protein state to the external voltages applied. When simulated under a voltage bias, the difference between the displacement charge of the two systems (open and closed) represents the gating charge of the channel. The open probability of the channel at a given voltage, is then determined from the difference in the free energy of the two protein states (open and closed) at this particular voltage. The gating charge of Kv1.2 calculated for the ful tetrameric channel (left) and an individual VSD (right). The calculations are performed on the open and closed state models of Kv1.2 (Pathak et al. Neuron 2007,56:124-40). The models are refined through externsive MD simulation in a membrane environment prior to these calculations. Across a perfectly homogeneous lipid membrane, the electrostatic potential drops linearly from the interacellular to the extracellular side. However, the irregular shape of the protein and its dielectric inhomogenity modulates the membrane potential within the VSD. In particular, water-filled crevices within the protein change the spatial variation of the potential across the membrane. Using free energy calculation in MD simulations, we have calculated the electrostatic free energy of several residue side chains along the TM helices of the voltage-sensor domains (VSD). These residues are known to move within the transmembrane field when the channel transitions from the open to the closed state, and contribute to the gating charge. We have calculated the transmembrane potential at the position of key charged residue side chains inside the VSD. In these calculations, the intracellular solution is assumed to be at potential V=1, while the extracellular solution is grounded. The calculations reveal that the transmembrane potential drops rapidly over a distance of about 10-15A within the protein. Such a sharp drop in the potential results in a very focused electric field within only one third of the bilayer thickness. The sharp drop in the transmembrane potential is due to the presence of a water-filled crevice located within the VSD, which provides a high-dielectric medium in contrast to the low-dielectric medium of the surrounding protein and lipid molecules. Fraction of transmembrane potential acting on key charged residues of the VSD plotted against z-axis normal to the membrane. In the open state of the channel, the potential acting on the gating residues (R1-R4) varies from its full value (at z=-5 A) to zero (at z = 10 A) over the extracellular half of the membrane bilayer. As a result, all four gating arginines positioned within 15 A of the membrane-solvent interface are exposed to the extracellular potential. This trend is also seen for the closed state of the channel. Although, the closed conformation of the VSD places the gating arginies near the intracellular inteface. These arginines, spread over a distance of ~10 A, are exposed to the intracellular potentia at 1V. Displacement of charged residues across the membrane potential results in the transfer of a net electric charge across the membrane that can be detected as gating currents in electrophysiological experiments. For example, in the open state of the channel, R4, the forth gating arginine of the VSD, is positioned near the center of the membrane at 0.2 of the potential. In the closed state of the channel, R4 is placed near the intracellular potential at 0.9 of the voltage bias. Upon transition of the channel from the open to the closed state, movement of R4 results in the transfer of 0.7 elementary charges across the membrane. We have determined the contribution of individual charged residues of the VSD to the total gating charge. The results show that the gating charge mainly arises from three of the four arginines, R2, R3, and R4, and the average movement of these residue side chains is about 9 A normal to the membrane. The gating charge for the refined models of Pathak et al. are in reasonable agreement with experimental values obtained for the Shaker potassium channel (~13e). The difference can be accounted for by considering the contribution of individual residues to the gating charge. In contrast to what was expected, our results showes that R1, the first gating arginine, does not move signitficantly within the membrane potential. 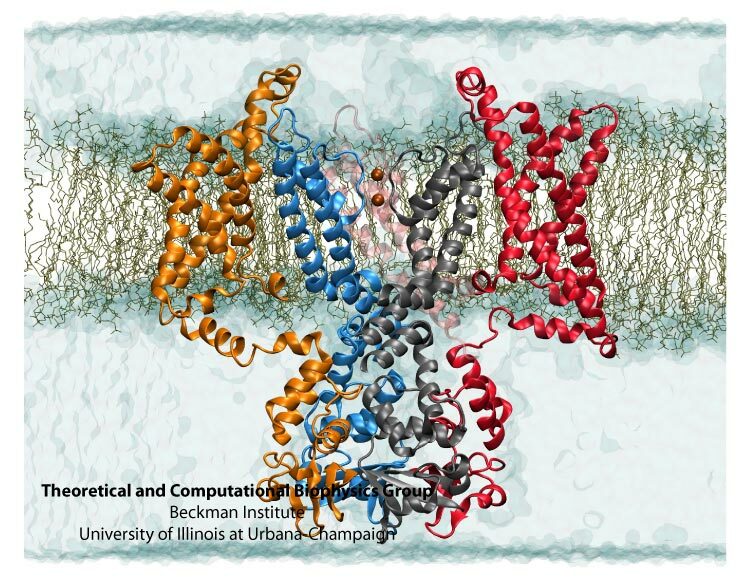 We have performed steered molecular dynamics (SMD) simulations, in which the side chain of R1 is pulled down toward the intracellular solution, and the total gating charge is monitored during the course of the simulation. The results show that relatively small motion of these residue side chains is sufficient to increase the gating charge by 2.5 e. During these simulations, rearrangement of arginine side chains is accompanied by disrupting a salt bridge interaction between R1 and E0 (on the S1 segment), and replacing it with strong interactions between R1 and E1 (on the S2 segment), which appear to block the entry of water molecules from the extracellular side. These results suggest that, rather than being the true resting state existing under hyperpolarizing conditions, the initial closed state model corresponds to an intermediate substate appearing early during channel activation. Permeation of potassium ions through VSD. Voltage sensor domains (VSD) consist of four transmembrane segments that form an anti-parallel helical bundle (S1-S4). Mutation of the first gating arginine (R1) on the S4 segment to smaller uncharged amino acids such as serine or asparagine will turn the VSD into an ion channel, allowing permeation of cations through these helical bundles while the main ion conduction pore is closed. These currents, known as omega currents, travel through the VSD and are distinct from the K+ currents passing through the central ion conduction pathway. Omega pores are cation selective, and have a slight preference for larger cations. We have performed molecular dynamics simulations of ionic permeation through the VSD in its resting state conformation. Simulations of the wild-type VSD and four of its mutants revealed the presence of a negatively charged constriction region near the center of the membrane which might act as a selectivity filter that prevents permeation of anions through the pore. Two highly conserved charged residues, R1X and E1, on two helical segments of the VSD form part of this selectivity filter. Mutation of these residues, both in experiments and our simulations, significantly increases the magnitude of the omega-current, another indication that the resting state model of the VSD obtained through our simulations is a viable representative of the functional state of the protein. Molecular dynamics investigation of the w current in the Kv1.2 voltage sensor domains. Fatemeh Khalili-Araghi, Emad Tajkhorshid, Benoit Roux, and Klaus Schulten. 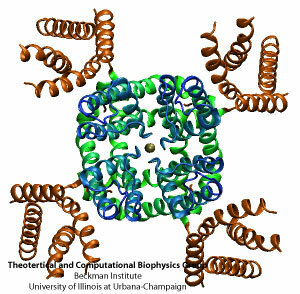 Biophysical Journal, 102:258-267, 2012. Calculation of the gating charge for the Kv1.2 voltage-activated potassium channel. Fatemeh Khalili-Araghi, Vishwanath Jogini, Vladimir Yarov-Yarovoy, Emad Tajkhorshid, Benoit Roux, and Klaus Schulten. 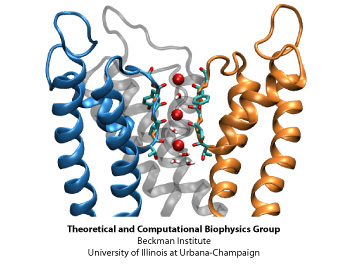 Biophysical Journal, 98:2189-2198, 2010. Dynamics of K+ ion conduction through Kv1.2. Fatemeh Khalili-Araghi, Emad Tajkhorshid, and Klaus Schulten. Biophysical Journal, 91:L72-L74, 2006. Page created and maintained by Fatemeh Khalili-Araghi. Contact Us // Material on this page is copyrighted; contact Webmaster for more information. // Document last modified on 30 Jan 2012 // 127617 accesses since 26 Jul 2006 .